Your market timing strategy is critical to your success as a swing trader. When the stock market rallies, 3 out of 4 stocks will move up with the market. On the other hand, when the stock market sells off, 3 out of 4 stocks will decline with it. So, it makes sense to time your trades with the market because you want catch these rallies and avoid the declines! The first thing you want to look at is a chart of the S&P 500. 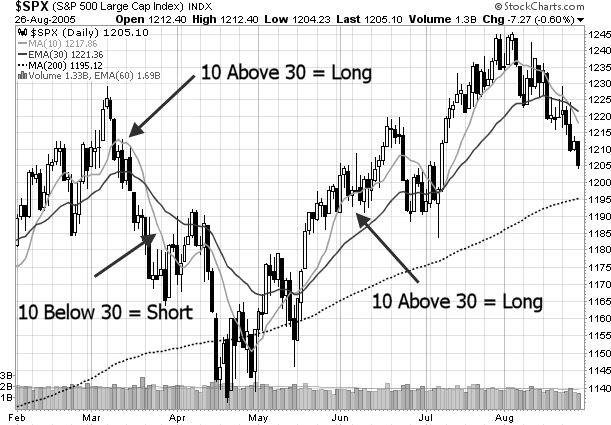 Look at the 10 SMA and 30 EMA to determine if you should be focusing on long positions or short positions. Here are the rules for timing your trades to the market using moving averages. If the 10 SMA is above the 30 EMA, you should be focusing on long positions only. If the 10 SMA is below the 30 EMA, you should be focusing on short positions only. Looking at the chart above, you can see how these moving averages create focus. This part of your market timing strategy answers the question of what types of trades to focus on (long or short). Moving averages are trend following indicators. As such, they will only work well in trending markets - not when they are the market is trapped in a trading range. I'm not really a big fan of technical indicators but Williams %R is useful to get a general idea of when the market has reached a short term extreme and is likely to reverse. 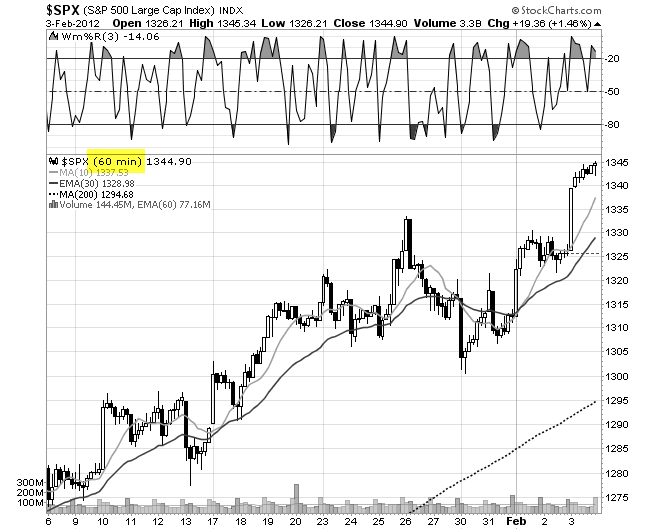 It calculates the close in relation to the range over a set period of time. The default setting in most charting packages has it set at 14 periods, but we would like it to be a little more sensitive than that so we will use a 3 period setting. Here are the rules for timing your trades using Williams %R. When the 10 SMA is above the 30 EMA, we will look to go long when Williams %R is less than -80 (over sold). When the 10 SMA is below the 30 EMA, we will look to go short when Williams %R is greater than -20 (over bought). The more over bought or over sold Williams %R gets, the more likely a reversal will take place. Look for those times when Williams %R gets to -90 or below for long positions, and -10 or above for short positions. In the chart above of the S&P 500, notice how we ignore short positions when the 10 SMA is above the 30 EMA and only focus on the long side. Even though Williams %R is over bought (above -20) we only want to trade in the direction of the trend. 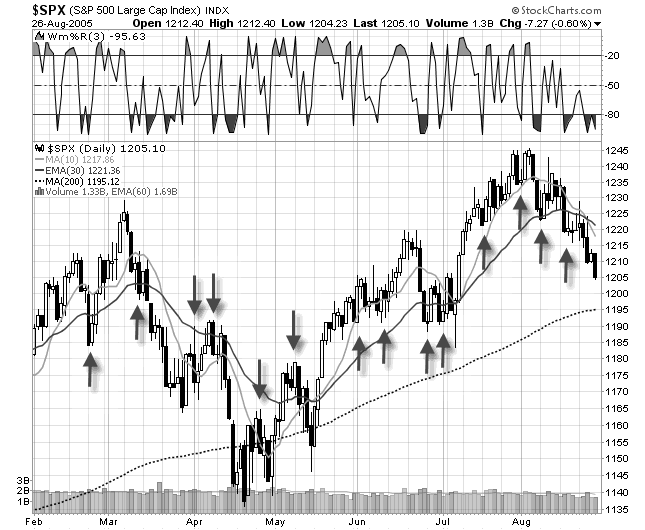 Also, notice how we ignore long positions when the 10 SMA is below the 30 EMA and only focus on the short side. Again we only want to trade in the direction of the trend. On the right edge of the chart the 10 SMA has just crossed down through the 30 EMA so we can no longer trade on the long side. Instead, we will manage our existing trades and wait for Williams %R to get above -20 to focus on the short side. See how you are NOT predicting what is going to happen in the future? That is a waste of time because nobody knows what the stock market will do in the future. Instead, you have to react to whatever the chart tells you to do right now. Looking at the right side of the chart, you will see that Williams %R hasn't moved into oversold territory (less than -80) in over a month. So, what do you do? Do nothing. Wait for the market to slow down and pull back. Move down to the hourly chart. When the market is running on momentum you will find that when you run a scan there will be few trading opportunities. That's because, like the market, there are few stocks pulling back enough to show up on your scan! 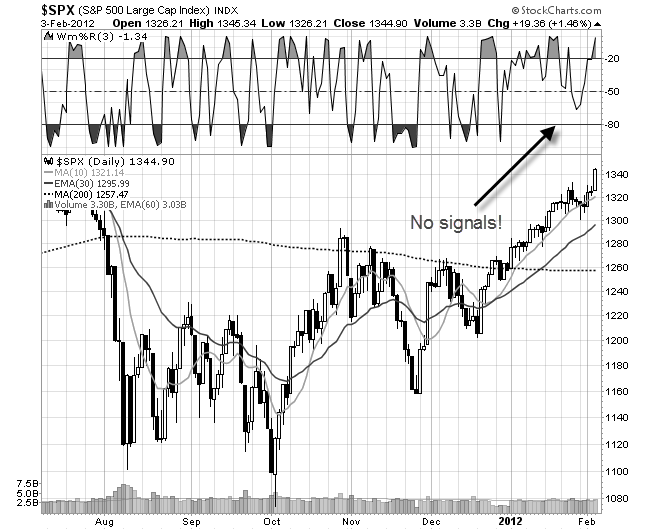 How do you know if the market is in "momentum mode"? One easy way to determine this is to look at the ADX indicator. Reading above 25 indicate a strong trend that will likely offer few pullbacks. Also, here is a video I made of a little market timing trick that uses the 20 period moving average on the hourly chart. This method is super easy and it will keep you on the right side of the trend most of the time. Use the market timing methods described on this page to identify when to establish long or short positions. But keep this in mind: Once you are in a stock, trade the chart of the stock itself and forget about the market. You are only using this method to establish new positions - not to exit positions. Also, keep in mind that moving averages and technical indicators are subjective - price is not. So, you should always be looking at support and resistance levels on the major indices.